People spent months on it with zero infrastructure, just living in the desert. They did it to make a place were visitors could say goodbye to grief that had been plaguing them - literally every inside surface was covered in painful tributes to lost loved ones. When it was set on fire, the entirety of the city stood there dead silent and watched it burn... The Temple is different, though. It's what people visit to let go of things, usually loved ones who have recently died. By the end of the week, it's covered in Sharpie writings saying goodbye, photographs, possessions of the deceased, and sometimes even ashes. Literally covered. It's a very, very heavy place to visit, and a really useful ritual in processing grief... Not just loved ones but mementos of memories you need to let go of. Think pictures from abusive relationships etc. I heard that it gets very, very quiet as everyone is experiencing their own very personal moment. i have seen that shape used for a church, but where? and when? Last year, we made a poster with pictures of our camp mate that died at a young age from cancer. It’s hard not to tear up when walking around the temple early in the week and seeing all of the tributes to thousands of loved ones mounted to the temple. Inthink it is one of most important thing at Burning Man, and it is a custom that evolved organically from the first temple. 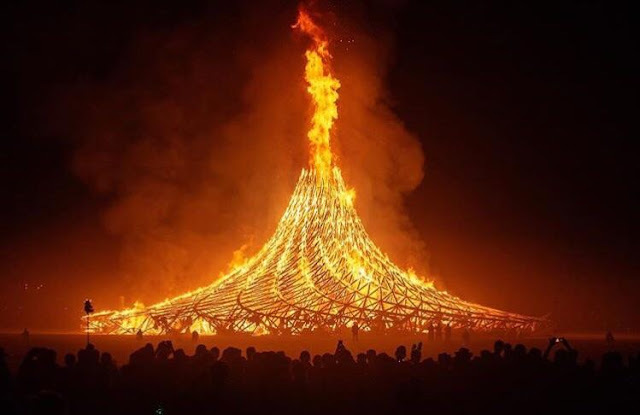 The temple burn is quite a thing to see, more impressive than the burning of the “man”.